A starting point is to lay out in simple big picture terms what the House and Senate budget resolutions passed earlier this year look like. The chart below tries to do this. It was put together from those resolutions passed last March. It provides the year-by-year totals (not ten years sums) needed to compare the two budgets. This kind of chart is more useful for comparing budgets than the ten-year multi-trillion dollar totals which few people can understand. The chart shows the recent history of federal outlays along with the path of outlays as a percentage of GDP under the Senate proposal and under the House proposal. There is a big difference in these two paths. Spending gradually comes down to pre-crisis levels as a share of GDP under the House plan and remains high under the Senate plan. I have been arguing since 2009 that undoing the recent spending binge is a reasonable goal, and prefer the House version on that count. My problem with his chart is its historical starting point is 2000 when Federal spending as a share of GDP was only 18.5%. Note the Ryan plan would bring us back to this level whereas the Senate plan would leave this share closer to 22%. A naïve reader might think the historical norm was the 18.5% observed in 2000, but my graph takes us back to 1961. And it turns out that Federal spending as a share of GDP was not always as low it was at the end of the Clinton years. The peace dividend years are over and future health care spending isn’t going to what it was in 2000 – but John Taylor wants us to think there is something magical and normal about the Ryan budget. I am the Harrisonburger making the prediction that fellow Harrisonburger, Mark Obenshain, whom I have known for decades, will be elected Attorney General of Virginia in the nationally watched election coming up in VA shortly. OTOH, I expect that the Dems, McAuliffe and Northam, will win the races for Governer and Lieutenant Governor, although neither of those is a sure thing, particularly the second. Of course, the most important race is that for Governor, and if the current polls showing Terry McAuliffe ahead of Ken ("the Cooch") Cuccinelli prove to be correct in the end, this will be the first time since 1973 when Republican Mills Godwin (a former Byrd Machine Dem) was elected Governor while someone from the same party sat in the White House, Republican Richard Nixon. The state has had a rebellious contrary streak since to always go for someone of the opposite party to the person in the WH. But, moderate Republicans are angry at how Cuccinelli grabbed the nomination in a stacked conventino rather than having a primary over Lt. Gov. Bolling, GOP business leaders in NoVa have been unhappy at the Cooch's opposition to the transportation plan put forward by GOP Gov. McDonnell (whose scandal problems have not helped and in which the Cooch is also somewhat involved), although now the Cooch says that he will not undo the plan, on top of which there are the impacts of the government shutdown, massively unpopular across the board here in VA, which the Cooch has said he might have voted for, on top of which Libertarian candidate Robert Sarvis is scoring 10% in the polls reportedly drawing more from otherwise likely GOP voters than from likely Dem voters. The two have their final debate tonight, but unless one of them makes some massively idiotic statement, I doubt it will affect things much. However, I suspect the outcome will be much closer than most polls show. I see three reasons: 1) Cuccinelli has intense support from his base, which will turn out, and WaPo today reported that in the final stretch he is leaning to the base, not playing ads in NoVA and trying to get it out; 2) Some of those Sarvis voters will probably "go home" to whomever they initially supported on "don't waste your vote" argument, with that probably adding a few points for the Cooch, and 3) Two weeks is the limit of short-term memory, and while now only one week after the end of the shutdown many are very angry and motivated against Cuccinelli, by election day a lot of those softer supporters, minorities and younger voters will have gotten past that immediate annoyance and may lose their anger and motivation. The Cooch can still pull this off, particularly if McAuliffe stumbles and says something stupid. BTW, my own personal opposition to him has many grounds, but probably at the top of the list is the lawsuit he brought against the University of Virginia as AG demanding all the emails and other records of climatologist, Michael Mann, from when he was at UVa. Mann has been at Penn State for some time, so this was a dredge through ancient history to try to find some nonexistent smoking gun disproving global warming, which did get rejected by the courts. But, quite aside from the specifics of the global warming issue, this assault on academic freedom is simply beyond the pale for me. The Lieutenant Governor race is more important than one might think because the state Senate is evenly split between the parties. Who is LG determines who controls the Senate, and currently that is relatively moderate but still GOP Bill Bolling. If Northam beats Jackson, as polls suggest, the Dems will gain control. I note that Jackson is further to the right to the point of complete insanity, claiming that modern libearlism is worse for African-Americans than was slavery or the KKK. I note that he is an African-American minister and got the nomination out of 7 candiates at the convention that was heavily dominated by Tea Partiers impressed by whomever could be farther and crazily to the right than the others. That proved to be Jackson, who is so far out that the other two GOP candidates have clearly avoided being seen with him. But, the lack of a Libertarian distraction and as a spinoff if turnout strongly favors the right wing base, Jackson couild win, and very likely will if Cuccinelli does. This is not out of the question. Which brings us to my fellow resident of Harrisonburg, the GOP AG candidate. Mark has long been asociated wtih the conservative wing of the VA GOP, with his late father having been one of the main leaders of that wing in the past. His cred with the Tea Partiers is solid, and there is little distance between his and Cuccinelli's views. Indeed they are personally close, having shared a desk apparently in the state Senate, where Mark is still our local Senator, while the Cooch was there prior to getting elected AG four years ago. Nevertheless, Mark looks like the rational moderate compared to the other two and also does not have a Libertarian distracter. The polls show his Dem opponent Herring slightly in the lead, but that race is clearly much closer than the other two. I suspect in the end the enthusiasm factor of the TP base, plus some more moderate types willing to vote for him as he has assiduously avoided saying obviously crazy things, will put him over the top. Nevertheless, he really is a social and otherwise conservative along Cooch lines, and when he was on the Board of Visitors that oversees James Madison University (JMU) where I teach economics, he made his biggest splash making the student health center not be able to hand out contraceptives. If elected, he will not be undoing the moves that Cuccinelli made to close down abortion clinics and other such policies. Update: One more serious problem with Cuccinelli is that unlike the previous 6 VA AGs who ran for higher office over several decades, he has not resigned his position prior to running. As it comes down, there are major legal issues arising over this election, most noticeably the purge of 57,000 voters from the lists, supposedly illegal, although it is increasingly clear that a substantial minority of them are properly and legally registered, although there is no way to adjudicate all this prior to the election, and, guess who?, is responsible ultimately for overseeing this? Well, Ken Cuccinelli, candidate for Governor and sitting Attorney General. This scum must not become Governor. Period. He said he is baffled by all the blame that has been piled on him. Since the recession, critics have said the increased money supply and low interest rates during his tenure at the Fed from 1987 to 2006 led to bubble investments. Mr. Greenspan first heard that theory, he says, in 2007, when John Taylor, a professor of economics at Stanford University who has advised Republicans, made the connection between easy money and the housing bubble. "It had absolutely nothing to do with the housing bubble," he says. "That's ridiculous." His latest book, oddly named “The Map and the Territory,” is meant to be an account of his intellectual journey to discover why, as the nation’s top bank regulator and its most famous economic prognosticator, he failed to see it all coming. Why had the markets, which for centuries had been so adept at self-correction, failed this time? Why had bank executives, with every incentive to protect their fortunes and reputations, knowingly gambled it all away? What we find, however, is that Greenspan’s journey of discovery brings him right back to where he began — to an unshakable faith in free markets, an antipathy toward market regulation, and a conviction that progressive taxes and social spending are to blame for slow growth, stagnant wages and exploding deficits. Those who have followed his career know that it was Greenspan who gave the green light to bank consolidation, Greenspan who pushed financial deregulation, Greenspan who advocated new global rules that would have reduced bank capital reserves and Greenspan who blocked efforts to crack down on abusive subprime lending. But if you are looking for him to accept any responsibility for the crisis that ensued, you will be sorely disappointed. But I guess an economic advisor to Romney-Ryan isn’t going to criticize deregulation given it is the position of many leading Republicans that we should not re-regulate. This matters more than a historical exercise of where the Greenspan FED failed as these issues will face the Yellen FED. Taylor is already arguing that the FED should get back to his magical rule as soon as possible. Count me as hoping the Yellen ignores Taylor’s advice on monetary policy as she seeks to have our policymakers reverse some of the Greenspan deregulations. With debt default temporarily averted and the Federal government back open for a few months, we are already hearing certain members of both parties talking about “reform”. But tax “reform” typically refers to having the middle class lose a few tax deductions so that we can cut tax rates on the rich even more – and any Republican version of this would mean even less tax revenues. But don’t fret boys and girls as they will reduce spending via entitlement “reform”, which means again that the middle class and the poor would have even less income so the rich can pay less in taxes. What did Paul Krugman call this? So why don’t the center right Democrats who want to assist the Republicans in this agenda just drop the word reform and speak clearly? Is it because if they did speak in plain English, the public would turn against them? One small glimmer of hope is that the repeal of the medical device excise tax – which would be a giveaway to the medical device fat cats – was not part of yesterday’s deal in part because the dreaded Tea Partiers actually turned against this repeal. A small bit of light finally appears? Please, Mr. President, Just Bite The Bullet And Declare The Debt Ceiling Unconstitutional! Which it is, btw, the 14th Amendment and all that, although some fools think that Treasury can prioritize and just pay interest on the debt while not paying all sorts of other legally mandated bills. As it is, it is against the law not to pay legally mandated bills, although those who want to blow past the debt ceiling say that all that would be involved would be delaying paying the bills. But the effect would be very bad for the US and world economy, as leaders from all over the world are telling us about as loudly as they can, not that those who are pushing for a default are paying the slightest shred of attention to them. Quite aside from the fact that the debt ceiling is unconstitutional, even if, Mr. President, you are reported to accept the argument of Laurence Tribe that it is constitutional, you yourself have analyzed how given the current polarization, it just sets you and your successors up for repeated blackmail. You already caved in 2011 and are now trying to put the genie back into the bottle. It looks like it is not going, with Vix soaring and Congress just apparently unable to cut any sort of deal. Maybe, just maybe, Boehner will simply pass some six weeks extension at the last minute, but that simply puts the day of reckoning off six weeks. It is time to end this once and for all, even though you will probably be impeached by the loonies in the House. Rest assured that you will not be convicted by the Senate, and the world and history will be grateful, even if SCOTUS later stupidly disagrees with the judgment and reinstates the damned thing. Hopefully they will not, and the US and world economies and future presidents will be freed from this noxious law that never should have been passed and is the only one of its kind ever passed in any nation on the planet. Let us recognize that in fact we really do not know what will happen if there is a default. It may well be the case that those saying consequences will not be all that bad may prove to be right. Interest rates will go up in the US with a slowdown in US growth, but adjustments will be made and the world will not come to an end. OTOH, there is a really serious downside tail risk here, one that those who are more closely connected with the financial markets seem to take very seriously. One of the worst possible scenarios would be a complete freezeup of the repo bond market. The reason would be that what gets traded there are essentially short term Treasury securities, whose interest rates are currently soaring. This is the main market the Fed uses for its open market operations, and it is arguably at the very foundation of the entire global financial system. Causing it to freeze up completely by defaulting on the main security being traded in it might well lead to the Fed to being totally crippled in dealing with this crisis and essentially freezing up nearly every financial market in the world in a scenario that not only would make 2008 look like a picnic on Sesame Street, but could rival even 1931 as well. Yes, this is a less than 50% probability outcome, but, Mr. President, do you really want to risk this? Please act to forestall such an utterly disastrous possibility. One guy gets a Nobel for showing that asset markets are efficient. Another gets one for showing that they are nothing of the sort! Go figure. As long as this op-ed was, could Mankiw have noted that Obama decided not to go for the progressive’s preferred approach – universal health care? Obama instead put forth a plan that John Gruber designed, which was the same plan that Governor Romney adopted in Massachuetts. In other words, he reached out to the other side and adopted what used to be the Republican alternative to universal health care. He also was willing to work with Republicans but these same Republicans acted just like the Eagles and the Rattlers in his summer camp parable. While calls for comity are admirable, we need to start the process with at least a shred of honesty. The Federal Reserve won't keep interest rates low forever. The demographic crunch will only get worse. So once interest rates rise, borrowing costs will spike. If we miss this moment, the debt will spiral out of control. the discretionary spending levels in the Budget Control Act are a major concern. And the truth is, there's a better way to cut spending. We could provide relief from the discretionary spending levels in the Budget Control Act in exchange for structural reforms to entitlement programs. These reforms are vital. Over the next 10 years, the Congressional Budget Office predicts discretionary spending—that is, everything except entitlement programs and debt payments—will grow by $202 billion, or roughly 17%. Meanwhile, mandatory spending—which mostly consists of funding for Medicare, Medicaid and Social Security—will grow by $1.6 trillion, or roughly 79%. The 2011 Budget Control Act largely ignored entitlement spending. But that is the nation's biggest challenge. Federal revenues under the extended baseline are now expected to be substantially lower in coming decades than CBO projected in 2012 (see the top panel of Figure A-2). By 2023, revenues are projected to be 2.8 percent of GDP lower than projected in the 2012 analysis: 18.5 percent of GDP rather than 21.3 percent ... Noninterest spending under the extended baseline is now expected to be lower in coming decades than CBO projected in 2012 (see the middle panel of Figure A-2). Specifically, noninterest spending in 2038 is projected to be 1.4 percent of GDP lower than in the 2012 analysis. Even though Romney-Ryan lost the election in 2012, they have won in terms of getting spending cuts to pay for making the Bush tax cuts permanent. But they want even more spending and tax cuts and are mad that President Obama is not capitulating again. President Obama has finally seen the light and agreed to nominate Janet L. Yellen as Fed Chair. Sen. Corker of TN is against her, but otherwise it looks like she has overwhelming support in the Senate and will be confirmed quite easily. Futures on stock markets are up despite falling sharply today as it increasingly looks like not only might the shutdown get fail to get solved soon, but there might actually be a default by the US government. Although Obama is reportedly saying that this decision had nothing to do with the current budget crisis, word of it has sent futures on the stock market upwards, although that will probably get quickly reversed if there continues to be no resolution. In any case, it takes one element of uncertainty off the table in a period of sharply rising uncertainty, with the VIX having risen over 50% since Sept. 20. As it is, that old Chinese curse holds, "May you live in interesting times." It may well be that if there is a failure to raise the debt ceiling or otherwise get around it with a major financial crisis ensuing, it will hit while Bernanke is still officially in charge. But clearly Yellen will be faced with having to deal with the cleanup of the mess that will ensue. While one can poke at this or that aspect of her views, there is no doubt that she is as qualified and capable as any potential Fed Chair to handle these potential upcoming "interesting times" as anybody else out there, with her excellent track record of forecasting as documented by the Wall Street Journal encouraging in this respect. In any case, whatever anybody thinks of her, we all should wish her the very best in dealing with these "interesting times," which threaten to get just all too interesting in the near future. BTW, I cannot resist reminding one and all for the record that I was the first person on the planet to publicly call for her to be appointed as Fed Chair, and I did it all the way back in July, 2009 right here on Econospeak. So I am pleased to pat myself on the back publicly in seeing my long ago request finally being fulfilled. Of course, I must applaud it, :-). Right now, many House Tea Party members believe that a default is impossible because we can prioritize interest payments to go first. My Harvard colleague Martin Feldstein writes me in an email: The WSJ and FT continue to write about the risk of default, quoting the Treasury, Boehner and others. There really is no need for a default on the debt even if the debt ceiling is not raised later this month. The US government collects enough in taxes each month to finance the interest on the debt, etc. The government may not be able to separate all accounts into "pay" and "no pay" groups but it can certainly identify the interest payments. An inability to borrow would have serious economic consequences if it lasted for any sustained period but it would not have to threaten our credit standing. Whatever! OK – on a more serious note, Menzie Chinn takes a look at what happened to the S&P 500 index “when we last came close to a breach, but the Government didn't actually default”. An entitlement-driven disaster looms for America ... True, the federal deficit has fallen to about 4% of GDP this year from its 10% peak in 2009. The bad news is that, even as discretionary expenditure has been slashed, spending on entitlements has continued to rise—and will rise inexorably in the coming years, driving the deficit back up above 6% by 2038. A very striking feature of the latest CBO report is how much worse it is than last year's. A year ago, the CBO's extended baseline series for the federal debt in public hands projected a figure of 52% of GDP by 2038. That figure has very nearly doubled to 100%. A year ago the debt was supposed to glide down to zero by the 2070s. This year's long-run projection for 2076 is above 200%. A year ago, the CBO was required by law to calculate its extended baseline by assuming that all of the tax cuts originally put in place in 2001 and 2003 would expire at the end of 2012, and never be reinstated. In other words, the document that Mr. Ferguson references says precisely the opposite about spending from what he is trying to claim in his Wall Street Journal oped. Did he really read the entire thing? If so – he could not have missed this central point. It is not surprising that controversies surround the issue of whether an economic “recession” is over or not. This is especially true for a world-shattering episode like the Great Recession that started in late 2007 and ended in the middle of 2009. The dates I just quoted were determined by a committee of economists at the National Bureau of Economic Research. Contrary to what most textbooks say, however, such dates are subject to debate. So below I present another new gauge to indicate when economic recessions occur, on top of the one I discussed in an earlier blog post. The new one is based on the officially-measured unemployment rate (U3). But to set the stage for this, alas, I must first repeat some of what I already said in an earlier post. I promise to throw in a tiger analogy to make things more interesting. There, I discussed a major contrast in perceptions: while the NBER, many economists, and most pundits declared the Great Recession “ended” as of July 2009, many or even most folks outside of this charmed circle say “the recession isn’t over!” Using a year-to-year fall in the inflation-corrected median household income as indicating the existence of a “recession,” it turns out that popular perception was almost completely correct. However, further examination of how the dates of recessions’ peaks and troughs are set suggests that more is going on. Even though many dislike the phrase, the idea of a "jobless recovery" actually makes some sense in terms of the normal workings of capitalism. In contrast, so-called “ordinary” folks, for whom the economy’s situation is up close and personal, often see a “recession” as including not only the period when the economy is falling but also the quarters or even years when it’s stagnating in the aftermath of an “official” NBER recession. We should be heartened by the fact that the economist Lawrence Ball’s Money and Banking textbook takes a similar tack: his recession adds what economists call a “recessionary gap” (i.e., real GDP hovering below its estimated potential) onto the back end of the falling real GDP conception.This fits with much of popular experience. However, this debate is really nothing but a difference about definitions. To my mind, there’s no point in arguing about which definitions are “correct.” A fight over whether that big creature that’s about to stomp on us is a Brontosaurus or an Apatosaurus is totally sterile. And does it really matter whether we call a thumb a “finger” or not? But we should remember that this disagreement arises because people are speaking slightly different languages, based in their different life experiences and intellectual approaches. Median Income Recessions. But there are more serious differences. As noted in the previous blog post on this subject, the economists and pundits are likely gauging a “recession” using the wrong numbers. For the vast majority of people, using inflation-corrected median household income is better than using real GDP (which is so central to the standard definition). Suppose that the Jones family represent the median household, i.e., one which is smack dab in the middle of the income distribution. If they find that their money income isn’t keeping up with inflation (so that their real income falls), that disrupts their efforts to make ends meet and may drive them to borrow to maintain their standard of living. That is, the Joneses must cut back, canceling visits to movie theaters, sit-down restaurants, and even doctor’s offices. This is exactly the kind of situation that the word “recession” evokes for most people. In the previous blog post, I determined the dating of Household Income Recessions using yearly data, since that is what’s available. It’s possible that quarterly data would be better, but the analysis suggests that recessions are a much more serious problem than the econopundits have seen. A year-to-year recession of household incomes captures the severity that most associate with this word. Using the median household income has the advantage of correcting the usual real GDP measures for the effects of population growth. In my post, I didn’t even mention this issue because it’s not very important in a rich country such as the United States. A different way to deal with the population issue is to use per capita or mean income (that is, the total GDP divided by the total population). But using real median household income to gauge recessions is highly superior. Per capita incomes can soar even though the 99 percent find our lives continuing to be nasty and brutish (and short, if we can’t afford medical care). This happens if the rich are garnering income hand over fist and grabbing the lion’s share of any increase in total income. In fact, that’s exactly the situation we’ve seen in recent years: in the aftermath of the Great Recession, the rich have been getting richer while most of the rest of us have continued to suffer. Thus, the Household Income Recession I found that corresponded to the NBER’s “Great Recession” ended in 2012 rather than in the July 2009. In fact, it may be continuing into 2013 or even later. Whether or not the Recession will continue can only be seen when the government cranks out the data (if they can find the money to do it). Ride the Tiger! An important criticism of the use of market incomes to gauge the onset and end of a recession is that both GDP and household incomes, whether they are measured in “real” terms or not, totally ignore non-market costs and benefits. They thus mis-measure the net benefits produced by the economy. In GDP calculations, the cost of pollution – think of the megatons of oil the BP’s oil disaster dumped on the Gulf of Mexico a few years ago – is not deducted, unlike the market cost of (say) the gasoline that goes into making the GDP. In fact, the clean-up costs from a massive oil spill can add to the value of GDP since it involves hiring and paying droves of workers! Further, the benefits of non-market activities – such as parents taking care of their own children – are also forgotten in GDP calculations. Thus, some have developed alternatives, such as the Genuine Progress Indicator to get an idea of the net sustainable benefits actually created by our economy for people. This criticism is totally on-target when we think about the quality of long-term economic growth (i.e., rises in the ability of the economy to produce). Are we building higher and higher GDP numbers by dumping costs on Nature? That may not be sustainable because they’ll come back to bite us in a few years. For example, GDP growth is promoted by dumping carbon dioxide into the atmosphere (rather than paying for it as a cost up-front). But the resulting rise in the sea level with likely create large economic costs very soon, if global warming isn't doing that already (as with all of the "weird weather" we've been having). The problem is that this criticism isn’t relevant to the issue of business cycles (a shorter-term matter). Remember that we live in a capitalist economy. That means that the vast majority of people are dependent on getting jobs and being paid wages or salaries. This makes us dependent on the health of the capitalist market economy – by its own standards. Even rich folks are dependent on the health of capitalism since they reap dividends, interest, capital gains, and/or princely executive salaries and bonuses that the system pumps out. GDP, despite its limits, measures capitalist health. This means that it real GDP stagnates, not many jobs will be created and not much property income will be garnered. So many or most people will suffer. I work for the private sector and my employer pays for part of my health insurance, but then again I just admitted that I was not watching this show. But let’s consider two possible ways of compensating the staff members of Congressman. Suppose Pascrell’s staff was paid $40,000 a year and got a health insurance package where the employee paid $50 a month and the government kicked in $150 a month. Sean Hannity would call that a 75% subsidy I guess. Suppose Congressman Salmon’s staff was not offered this subsidy but received $42,000 a year in terms of their Congressional subsidy. They then went onto a health exchange and got essentially the same insurance for $200 a month. Congressman Salmon’s staff would be getting an extra $200 a year precisely because the Federal government would be paying out an extra $200 a year per person. Which is just to say this has become one of the many stupid discussions in D.C. these days – for which we have Senator Grassley to blame. The chart nearby shows an index of marginal tax rates for non-elderly household heads and spouses with median earnings potential. The index, a population-weighted average over various ages, occupations, employment decisions (full-time, part-time, multiple jobs, etc.) and family sizes, reflects the extra taxes paid and government benefits forgone as a consequence of working. The 2009-10 peak for marginal tax rates comes from various provisions of the "stimulus" programs in the American Recovery and Reinvestment Act of 2009 and the extension of unemployment benefits to 99 weeks in some states. At the end of 2012, the marginal tax rate index reached its lowest value since 2008: 43.9%. A little over a year later (January 2014), the index will be close to 50%, driven up by the expiration of the payroll tax cut and multiple provisions of the Affordable Care Act. I have to admit that I have yet to read his NBER paper from which his graph is supposedly taken, but something in all of this looks mighty odd to me. 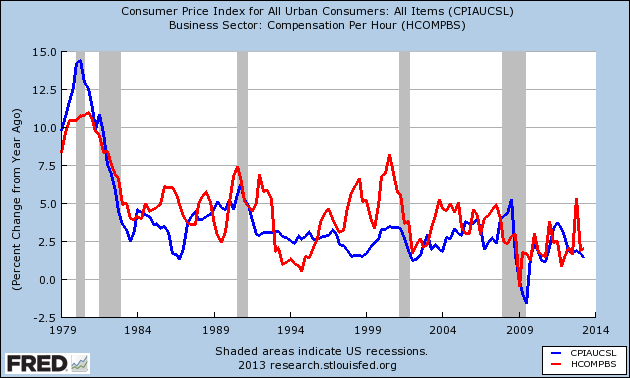 The graph starts in the good old Bush43 days before the Great Recession. I realize that the “1 percent” paid marginal tax rates close to 36% on their Federal income taxes and perhaps a bit extra depending on what state they lived in. But these same folks had a zero marginal tax rate from payroll taxes. Yet, the payroll tax holiday and its expiration change the Mulligan marginal tax rate calculation dramatically. OK, there are a lot of households that were affected by the payroll tax holiday and its expiration even at the margin, but their marginal income tax rate was never anywhere close to 36%. So one has to wonder how few households face anything remotely close to the marginal rates presented in this graph. Given its pro-Republican spin value, Greg Mankiw dutifully linked to it under The Coming Tax Hike supposedly from “The-Not-So-Affordable Care Act” but provided absolutely no commentary or insights. I guess you’ve guessed by now that I’m not buying this Mulligan but it also seems I should go read his NBER paper. 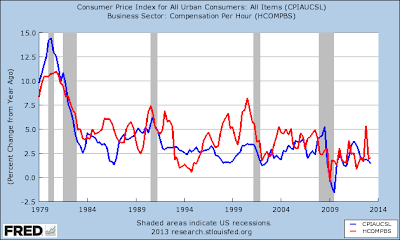 Any insights from other economists on whether this chart makes any sense or not would be greatly appreciated. As coauthor of a widely used comparative systems textbook (third edition now in preparation for MIT Press) who travels around a lot and talks to economists and policymakers in many nations, I have been struck by a nearly universal argument that has been made to me repeatedly, often with dripping contempt for the discourse in the US, an argument that they consider to be obvious and a matter of common sense as well as good economics, but that one almost never hears within the US. This is that the presence of negative externalities from having sick people walking around justifies making sure that everybody has health insurance, however one mananages to pay for it or organize it, so that people will get preventive care from physicians and not be wandering around infecting those around them. With the US being the only high income nation that does not have universal coverage, I do not know to what extent our poor showing on life expectancy (37th to 50th depending on source and how many micro states one includes on the list) is due to our failing to cover everybody and avoid this obvious negative externatlity, but I have no doubt it aggravates this poor performance. Of course, the joke is that the new ACA (aka "Obamacare," even though it was initially a GOP-supported plan out of the Heritage Foundation implemented in MA by Romney) does not provide universal coverage, although it increases coverage. The SCOTUS in an unprecedented and supremely stupid move dramatically reduced this expansion of coverage by allowing states to opt out of the Medicaid expansion in the law, with that the leading source of the hoped-for expansion of coverage, now limited, and with the states with the highest percentages of uninsured (25% in TX) being the ones with governors or legistlatures or both blocking adoption of the Medicaid expansion. I guess we should understand that at least one reason we do not hear this argument universally used in other nations is that ACA does not mandate universal coverage, although clearly the argument can be used to support the expanded coverage under ACA. Unfortunately, I think the subtext of opposition to universal coverage is just plain raw racism, people not wanting "them," the moochers of racial minority status, to get coverage, especially those illegal immigrants who should be encouraged to leave the country and certainly should not be given any coverage, even if them getting sick puts all of the rest of us at greater risk of doing so as well. In 2010, however, Congress, ravenous for revenue to fund Obamacare, included in the legislation a 2.3 percent tax on gross revenue — which generally amounts to about a 15 percent tax on most manufacturers’ profits — from U.S. sales of medical devices beginning in 2013. This will be piled on top of the 35 percent federal corporate tax, and state and local taxes ... Covidien, now based in Ireland, has cited the tax in explaining 200 layoffs and a decision to move some production to Costa Rica and Mexico. Yes – I am repeating myself but as I also noted on Sunday, the tax is on the wholesale price and not gross revenues as Will claimed. Here are a few other things Will seems to not understand. Covidien’s effective tax rate is 15% - not the 35% Federal plus state & local taxes Mr. Will talks about. Maybe he is thinking more along the lines of Medtronic. So I checked its 10-K filing for fiscal year ended April 26, 2013. Its pretax income was 25.6% of its sales, which means this tax would be far less than the alleged “15 percent tax” Mr. Will suggests. And its effective tax rate was only 18.4%, which is about half of what Mr. Will claims.